photo-eye Gallery Photographer's Showcase: Max Kellenberger photo-eye Gallery is pleased to announce the new portfolio Blues by Max Kellenberger on the Photographer's Showcase. 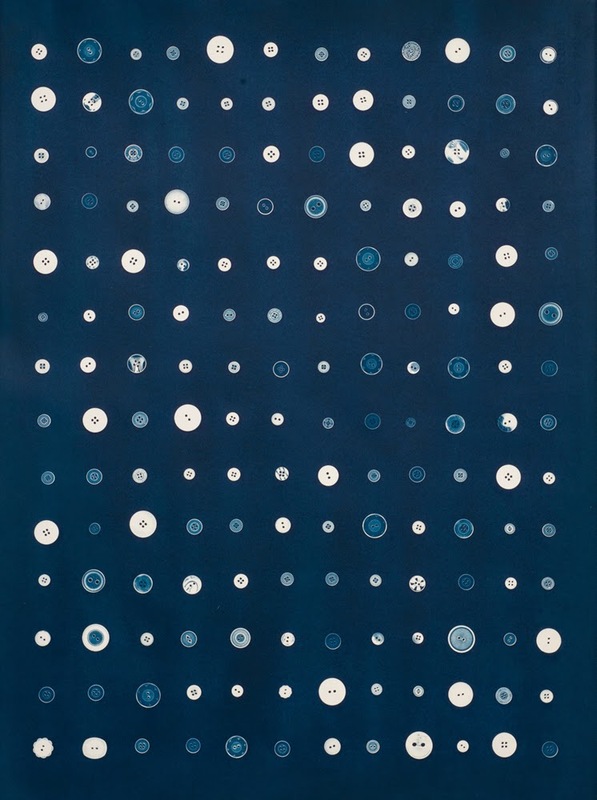 Kellenberger creates beautiful cyanotypes from every day objects and flora from inside and around his studio. We asked him to describe the painstaking process of arranging the little objects into elaborate patterns and what inspires his work. photo-eye Gallery is pleased to announce the new portfolio Blues by Max Kellenberger on the Photographer's Showcase. Kellenberger creates beautiful cyanotypes from every day objects and flora from inside and around his studio. We asked him to describe the painstaking process of arranging the little objects into elaborate patterns and what inspires his work. Erin Azouz: How did you get your start in photography? Max Kellenberger: I had a very early fascination with everything that emitted, reflected or captured light — maybe because I was so scared of the dark. And I was drawn to anything mechanical. No wonder I got so interested in cameras and the photographic process so early in my life. I remember one day noticing a "no photography" sign posted at a military installation, a picture of a camera with a red cross over it. That very night I had this dream were I was shouting out loud to a crowd: "But I want to make photographs!" I believe I was about nine or ten years old. And that was sort of the beginning. EA: How did the Blues series come about? MK: This goes back to my early childhood when I was terribly afraid of the dark. I remember trying to fall asleep at night being scared. Lying in bed I noticed a pattern being projected onto the ceiling — it was created by the light of the street lantern shining through the shutters and it sort of looked like a set of wrenches neatly laid out next to one another. Staring at it relaxed and comforted me and I could close my eyes. I believe there is something soothing about a repetitive pattern and repetition in general, maybe because repetition is a core principle of life, such as the heart beat and the breath. A few years ago I had the idea to create "blueprints" of everyday things and objects. Laying them neatly next to one another just like the image of the wrenches on the ceiling and therefore creating a wonderful pattern was once more very appealing to me. Since cyanotypes were historically used as blueprints it made sense to apply this very old technique for my series. It took me quite a while to figure out the technical details to make big borderless cyanotypes. But how fun to be working with these kinds of problems! What a relief to be away from the computer screen. EA: The grasses are quite different from the other pieces. Can you talk about what inspired you to create these pieces? MK: I have had a life long fascination and love for grasses. I find them elegant and beautiful. They often get overlooked because we are much more used to looking at flowers or trees. And maybe because they are all around us and do not require any special care, they are often considered "weeds." I am amazed how different they are from one another within the same species even though one might think they are all the same. Yes, I do love the reference to the history of photography. These prints are all unique photograms and a very literal interpretation of the meaning of the word "photography" — which is derived from Greek and means "drawing with light." 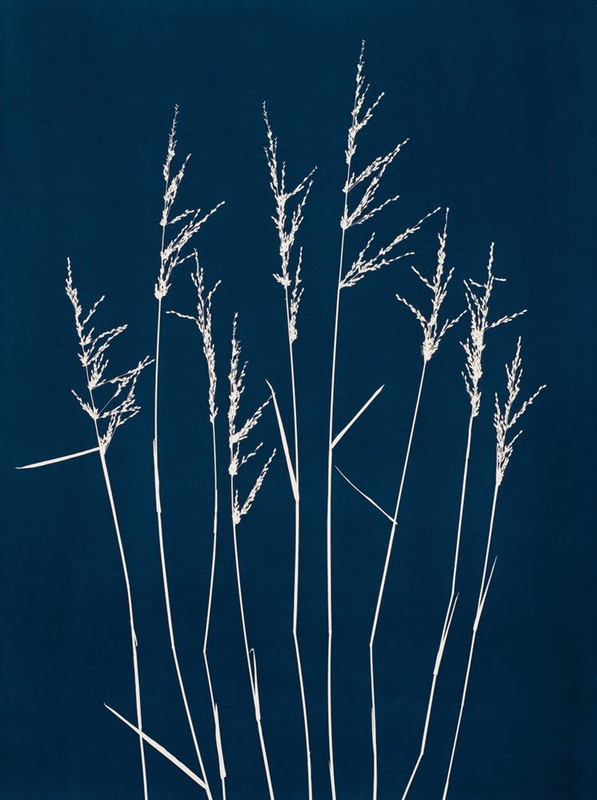 The grasses are a very traditional way of using the cyanotype technique. 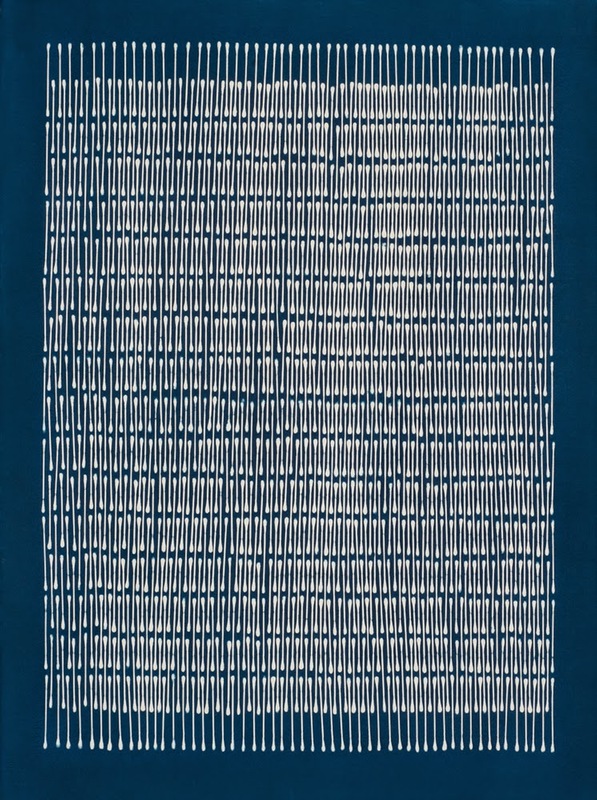 Some of the most well known prints were created by Anna Atkins in the middle of the 19th century. I am lucky to live very close to nature. I can just walk out from my studio and find all these beautiful plants. I love how the cyanotype reduces the amount of information by just showing a simple silhouette. 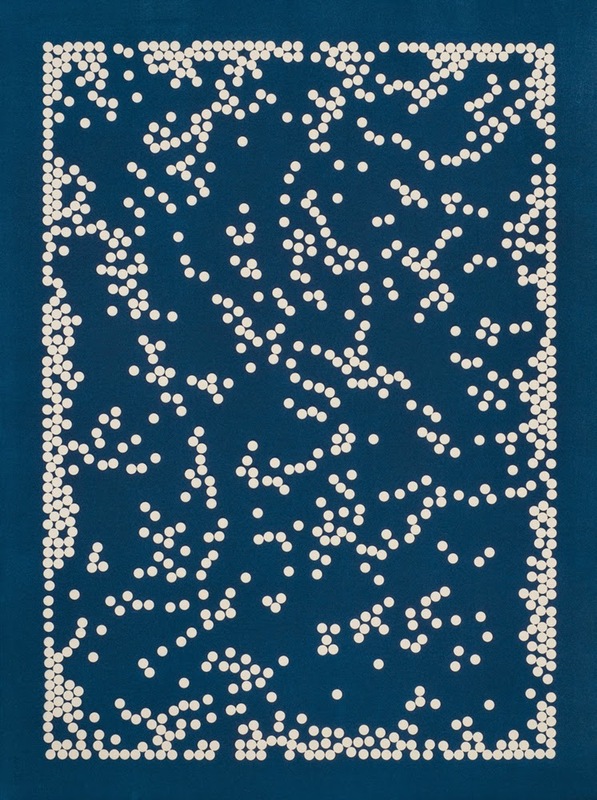 EA: I can't imagine how laborious it is to arrange so many little objects, such as the Q-Tip cyanotype. What does your process look like? MK: Yes, you are right. Some of the images were quite tedious to arrange — the Q-Tips being the most tricky one. I had to do it in several steps with frequent breaks in between. Practicing patience became a large part of the process! Some of the images were created by laying out the objects onto a big light box and then photographing them from above with a digital camera. From this file I would make a big life size digital transparency. With this I can print multiple cyanotypes. I did edition the prints to only three. 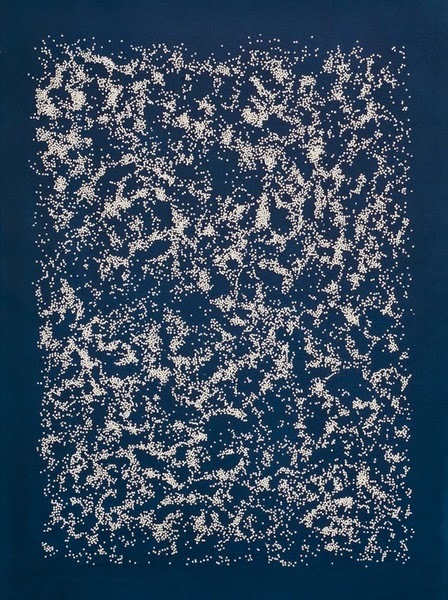 However, the most recent cyanotypes are simple photograms made by laying the objects directly onto the coated cyanotype paper and then exposing it under a very strong UV exposure unit. These are unique prints, like the "Bag of Buttons" or the "Red Quinoa" for example. All the botanicals are direct photograms and unique prints, too. The most difficult part is to coat the paper with the cyanotype liquid as evenly as possible. It takes a lot of practice and the success rate is still only about 50%. Each print is a bit different and imperfections become part of the image. For more information about Max Kellenberger's work or to purchase a print, please contact Erin Azouz at erin@photoeye.com or call 505-988-5152 ext. 202.